Companies differ not only inasfar as their business fields and goals, but also in regards to their company cultures. That’s why intranets and business networks likewise need to be designed individually. Whereas for your firm the most important components of your everyday business life are the newsfeed and CRM, while essential for another company is e.g. a wiki expert info area and an ERP link. Therefore it is a matter of adapting the individualized communication and collaboration solutions to the enterprise’s existing architecture – e.g. via (social) intranet for effective knowledge and idea management. Intranets have long played a strategic role in organizational development: While previously they were primarily seen as IT systems, in the meantime they are ever more frequently being embedded in human resources and communications departments. 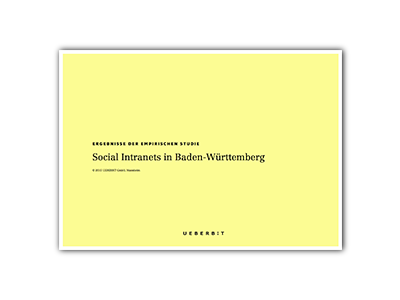 That was the result of our study, "Social Intranets in Baden-Württemberg", in which we surveyed exemplary executive leaders and decision-makers stemming from medium-sized enterprises in Baden-Wuerttemberg. We queried regarding management themes such as, goals, change processes, user adoption, etc. (90 % of these firms employ more than 500 employees).